First-time visitors might be surprised by the amount of development along the Grand Canyon’s south rim. But all that disappears when you see the view from the Grand Canyon’s south rim. Hikers can walk to all of the scenic view points along the south rim of Grand Canyon National Park. That’s more than 30 miles of non-stop scenery, not counting hikes below the rim! But for the less athletically inclined among us, the park road system provides access via bike, shuttle bus, or private automobile. The following is a sample of what you will see at various viewpoints along the rim. This tour begins at the park’s eastern entrance, moving to the west. It’s divided into three sections based on access options. For visitors with their own vehicle, Desert View Drive is the place to go to experience the glory of the Grand Canyon without all the crowds. The 25-mile road follows the south rim of the canyon through the east end of Grand Canyon national park. 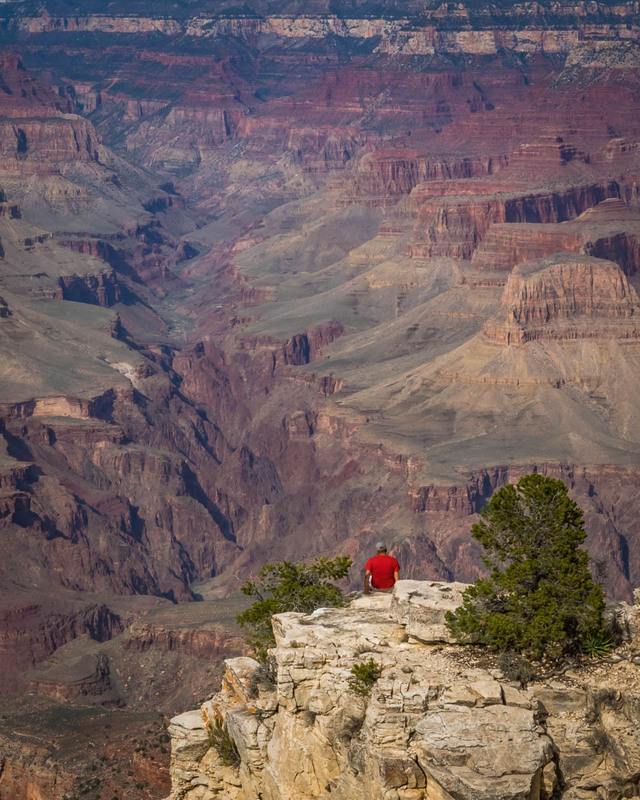 All viewpoints except Yaki Point and the South Kaibab Trail are accessible by private vehicle. You can hike in to both of those or pick up the shuttle at the Grand Canyon Visitor Center. Desert View is the eastern gateway to Grand Canyon National Park and the scenic views along the park’s south rim. As such, it offers a full range of services, including groceries, fuel, a snack bar, and camping. But we are here for the scenic view, so forget all of that other stuff and head for the Desert View Watchtower. This historic tower was built by architect Mary Colter in 1932 to look as if it were an ancient ruin. It’s a fascinating building, and well worth a bit of your time. However, it also provides great views of the canyon. Desert View provides a view down to the end of the Grand Canyon as well as views across it. As the highest natural viewpoint along the south rim, Navajo Point offers wonderful views both to the west and north along the Colorado River. Desert View is also visible from here. Lipan Point has a long open viewing area that allows visitors to see a number of features deep within the canyon. These include the Hence Rapids, the Unkar Delta (which was populated in ancient times), and a number of rock formations. Almost every picnic area and pull-off along Desert View Drive has some sort of name. But one of the few completely unnamed pull-outs offers wonderfully colorful views into the canyon. When I asked about it, a volunteer at one of the visitor centers laughed and said they just refer to it as the no name stop and agreed that there is a particularly fine view there. However, I suspect it is Papago Point, which is said to have some of the best views of the rim. There are a several points between Lipan and Moran that are said to be easily reached by walking along the rim or through the scrubby woods. It’s worth doing that, since there are many fine views and no other tourists in this area. But, of course, this spot was splendid even without hiking out to the point! There are lots of options for taking in the vista at Moran Point, including walking out to the point itself. Moran Point is named Thomas Moran, the American painter whose iconic images of the Grand Canyon’s vast expanse and grandeur helped bring about its protection a few decades later. Besides getting a good look at the canyon’s beauty, visitors to Moran Point learn about the canyon’s geologic features. Grandview is the southernmost point along the Grand Canyon. It was also the site of some of the canyon’s earliest tourist development – none of which remains today. The Grandview Trail down into the canyon is not maintained and recommended only for experienced hikers. However, if you follow the trail just far enough to get below the trees that block the view from the official viewpoint you are rewarded with wonderful views into the canyon. And that part of the trail is easy enough for most people – you don’t have to go very far. Private vehicles aren’t allowed on the road leading to the South Kaibab Trailhead or Yaki Point. We parked at a picnic area along Desert View Drive and walked into the South Kaibab Trailhead. In the morning there are nicely lit views of the canyon right from the top of the trail. We thought take we’d take the shuttle from there out to Yaki Point, which should have been gorgeous in the morning light. However, we would have had to walk the 1.5 miles back to where we parked because the shuttle doesn’t stop at the trailhead again on the return trip. In the interest of time, we skipped it. The only way to visit Yaki Point without walking back out is to take the shuttle from the Grand Canyon Visitor Center. With terrible light when we visited in the morning, I don’t have pictures that show a good view of the canyon from the Pipe Creek Vista. However, we found a few cool hoodoos in the area! This section of the south rim is home to most of the tourist services at Grand Canyon National Park. As such, it is the first place most visitors go and tends to be very crowded. But none of that makes the view of the canyon any less spectacular. If you are visiting the Grand Canyon’s south rim between March and November, you can park your car now. The section of the Rim Trail from Yavapai Point through the village is best explored on foot. From the paved trail, lookout points provide lovely views into the canyon while providing easy access through this part of the park. In addition, the area is also reasonably well-served by shuttle buses. You can’t do see everything, even in a couple of days and we ended up skipping east-facing Mather Point on our morning tour. It looks as if it has a splendid view into the canyon and would be a great afternoon stop, but it the whole area was so busy by then that we didn’t stop. Because it is right outside the main visitor center, Mather Point is one of the busiest viewpoints along the south rim. However, it looks stunning. We made a sunrise visit to Yavapai Point. It’s the northernmost point along the Grand Canyon’s south rim and has great views to both the east and the west. That makes is a particularly good spot to photograph either sunrise or sunset. This is also the site of the historic Yavapai Observation Station (Geology Museum), where visitors can admire the canyon and learn about its geology. From Yavapai Point, the Rim Trail continues as a paved path that follows the rim through the historic village area. There are wonderful views of the canyon all along the way. The section between Yavapai Point and the Verkamps Visitor Center in Grand Canyon Village is also part of the Trail of Time exhibit. This geology exhibit uses bronze markers to illustrate the passage of geologic time. At various points along the way, the exhibit has signs, rocks, and viewing tubes that show when the existing rock and rock formations came into being. The Trail of Time ends when you reach the historic village area. Although development in this area began even earlier, most of the historic buildings here were constructed between 1904 and 1935. While several of the buildings are hotels, all have public areas and exhibits that anyone can visit. If you are ready for a break, head over to the veranda outside the El Tovar’s lounge to enjoy a spectacular view of the canyon with your snacks and drinks. The Bright Angel Trailhead marks the end of the year-round public road through the park. From here a modern version of historic Hermit Road leads to the scenic viewpoints at the west end of this section of Grand Canyon National Park. It’s not the end of the road, just the point where the road is closed to private vehicles from March through November. If you are visiting during the winter, you can reach all of the view points along Hermit Road in your car. The rest of the year you can reach them on the park’s shuttle bus or by walking along the rim. This is the first shuttle bus stop and, like many visitors, we were eager to get farther along the canyon. Besides providing a view of the Bright Angel Trail as it works its way back and forth down into the canyon, this is said to be a good spot to view the historic El Tovar hotel. Maricopa point overlooks the Tonto Trail and the abandoned Orphan Lode Mine. The mine began as a copper mine, but was a productive uranium mine in the 1950s and 1960s. We skipped this stop too since we were mostly over here in the morning and would be looking into the sun. Powell Point also has a better view to the east than the west. However, some of the canyon is visible to the west, making it a popular spot for sunset photography. There is also a monument to Major John Wesley Powell who explored the Colorado River in 1869 and 1871-72. While the monument is elevated, it isn’t a great spot for viewing the canyon. Go out along the rim for that. Because Mojave Point faces west, we visited in the morning when the sunlight began to fill the canyon with light. There are several overlooks at Mojave Point, which help dilute the number of visitors and provide different perspectives of the canyon. At the aptly named Abyss, the canyon walls drop pretty much straight down for 3,000 feet. We were there in the morning, but this is a spot that would be much easier to view and photograph with the mid-day sun shining down into it. In the morning and evening the Abyss is in pretty heavy shadow. There is a nice view of the canyon from the Monument Creek viewpoint, although it is blocked on one side by the canyon wall. This is where the paved Greenway Trail begins. It follows the old alignment of the old road and provides access for hikers, bikers, and wheel chair users. Pima Point is stunning, with a vista that takes in 40 miles of the canyon with nothing to block your view. We visited in both the morning and evening. It was absolutely gorgeous at both times of day. The Hermit Road comes to an end at Hermits Rest. The interesting historic building here (another Mary Colter construction) houses a small gift store and café with rather limited hours. This area isn’t generally identified as a great view of the canyon. However, we liked the way the vegetation along the rim formed windows that forced us to look at just a bit of the canyon at a time. It was a nice contrast to most other south rim views where you are confronted with a vista that goes on forever. Here you are forced to look at a small piece at a time. 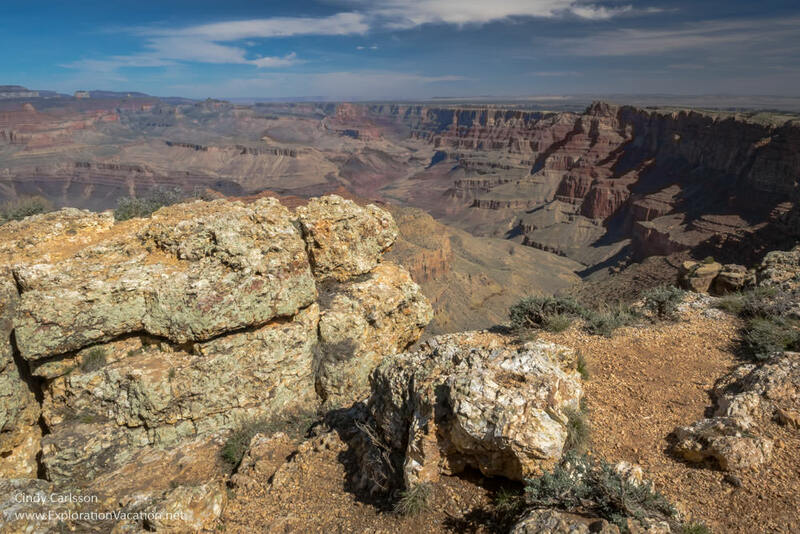 You can visit a few of the scenic viewpoints along the Grand Canyon’s south rim as a day trip from Phoenix, but it will be a long day and not very pleasant. Instead, plan to spend at least a night in or near the park. That will let you enjoy views of the canyon at different times of day and, maybe, at times when there are fewer crowds. It’s not much more than 30 miles between Desert View and Hermit’s Rest, but that doesn’t mean it is quick to get from one to the other. Allow much more time than you think you will need. A shuttle system provides access to most of the developed area along the Canyon’s south rim. The viewpoints west of the historic Grand Canyon Village can only be reached by foot, bike, or shuttle from March through November. On the other hand, there is no shuttle service to the easternmost viewpoints. Viewpoints around the visitor center can be accessed by private vehicle or shuttle. And, of course, all viewpoints can be reached on foot. The Rim Trail runs along 13 miles of the south rim, from the South Kaibab trailhead west through Grand Canyon Village to Hermit’s Rest. The trail is mostly flat and paved, making it easy to walk. Bikes are allowed on some sections of the trail. Sunrise and sunset over the Grand Canyon are glorious. For most photographers, the best sunrise and sunset shots will be found by facing away from the sun as it lights up the canyon. That means you want to look for west-facing views in the morning and east-facing ones in the evening. Or, ideally, one that gives you views in both directions. Shooting directly into the sun is tricky and without special filters, all you will capture is the sun above a dark, flat horizon. Usually you will be better off photographing the peaks as the sunlight highlights them. Sunrise in the canyon is lovely and will be far less crowded than sunset. I’m not a morning person, but I preferred sunrise to sunset. I really loved the light for most of the morning. Early to mid-afternoon was the most difficult time to take pictures when I visited in March. Unless you visit in the winter, there will be crowds. However, you can miss the worst of them at any time of year by getting up earlier. Viewpoints are almost deserted at sunrise and remain relatively uncrowded for several hours thereafter. Nor is there a long wait for shuttles in the morning, as there often is later in the day. While lodging can be more expensive and harder to find within the park, the ability to walk out your door and head over to the canyon shouldn’t be undervalued. And there is a range of lodging available at a variety of prices if you book in advance. We stayed in one of the Yavapai Lodge units. It was reasonably priced, comfortable, and convenient. I would love to stay in one of the historic hotels, but the few rooms available when I finally booked our trip cost more than I wanted to spend. There are completely separate booking sites for the park’s historic lodges and the newer Yavapai units. Instead of using either of those sites to book, I’d recommend TripAdvisor (affiliate link), which includes reviews and booking options (usually through a third party) for all of the hotels in the park, as well as those in nearby Tusayan. In the handful of times I’ve searched for rooms at the Grand Canyon, I’ve consistently found better prices through TripAdvisor than the direct booking sites. Yes, I make a small commission (at no cost to you) if you use my TripAdvisor link. However, it really does seem to be both the easiest and cheapest way to book a room along the south rim in Grand Canyon National Park. There are also a wide variety of camping options. This is a fantastic photo guide to the south rim. It’s been ages since I’ve been there, but plan on a return trip. Now that I live in Arizona, it’s a perfect getaway location. Great point about staying in the park. We did and it was amazing to wake up early and take in the gorgeous sites before anyone else. Thank you, Cathy. I think a return trip is in order – and now that you are so near, you can watch the weather forecast and sneak up there for a few days when it isn’t quite so busy, but the weather is nice. Or not nice, depending on your preferences – I’m thinking it would be really great to see the canyon with a bit of snow! I hope you have a lovely fall down there. You deserve some nice weather after the heat earlier this summer. 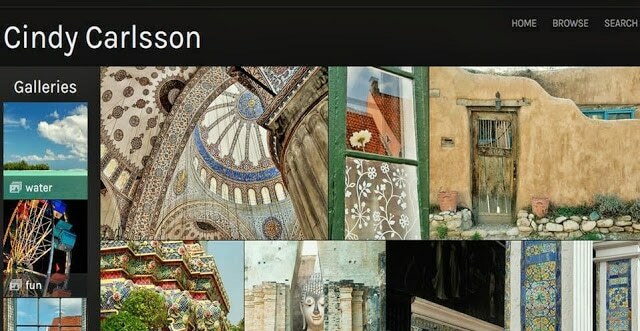 Wow, beautiful photos, especially the ones taken at sunrise and sunset! 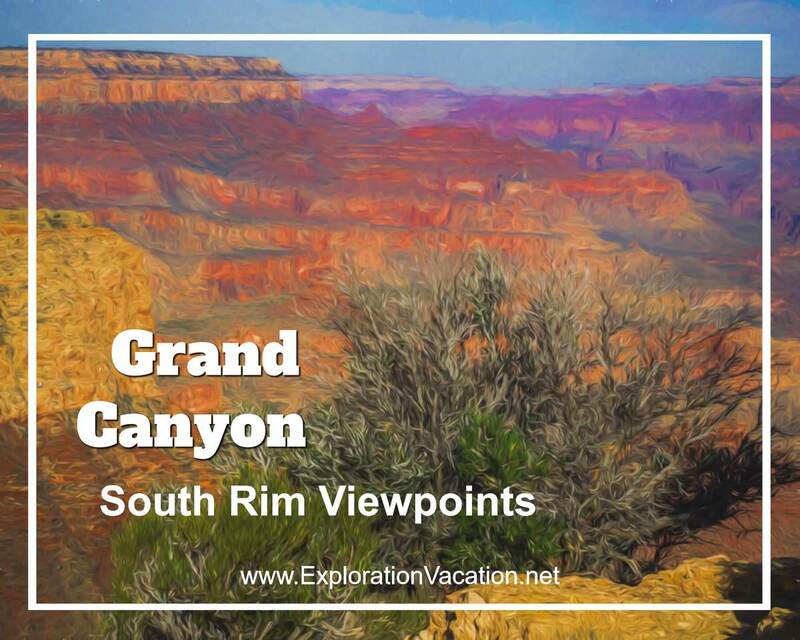 I have yet to visit the Grand Canyon, but when I do, I will definitely use this guide to go to the most scenic south rim viewpoints, avoid the crowds and get the best shots. Thank you! Thank you, Cindy! Do plan a trip down there – it’s really an amazing place. And try to get out at least once at sunrise. I am not a morning person, but it is so worth it to get up in the dark and head out to the rim to watch it light up. And the shuttles run (on a more limited schedule) before dawn, so you don’t even have to drive anywhere! 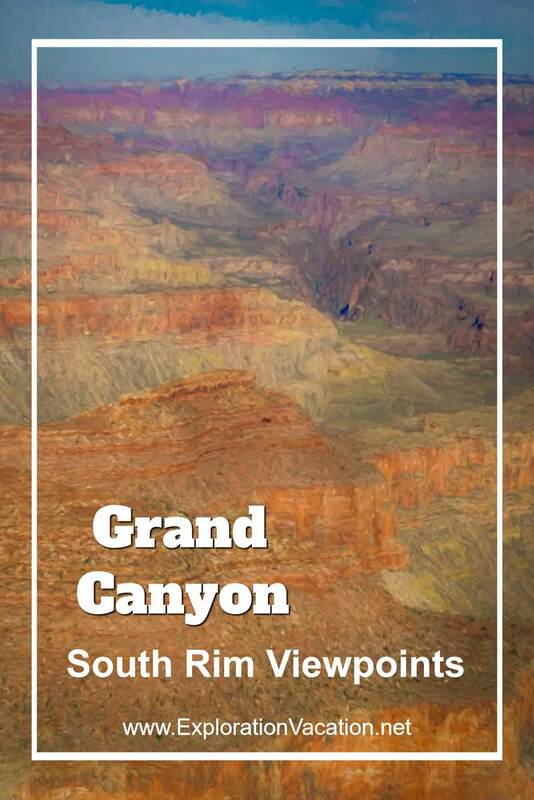 What a grand guide to the Grand Canyon’s south rim! I think I could go back every week – it changes every time the sun moves. Enjoy your next visit. Your guide is great. I live in the state of Arizona and have been to the Grand Canyon countless times. I am partial to the North Rim. There are less people and the views are stunning. Thanks, Carol. I appreciate that. It’s been quite a few years since we’ve been to the north rim – I think I need to go back to both so I can answer that question “Which is better – north or south?” Both are amazing. I am so excited and pleased that you did this post! I am planning our 2018 trip to NM and AZ right now. I will refer to it in my planning. We will have to go to the South Rim since it will be March. I am curious, can you drive a 25 foot camper van on Desert View Drive? Glad to help you with your planning! Desert View Drive is a regular road – it’s actually the only road through the park from the east entrance, so bigger vehicles than yours use it – and it is mostly flat and well maintained, so there shouldn’t be any issue traveling it in your camper van. You may have a bit of trouble parking at some of the more popular overlooks during busy times of the day. Most of them have big parking lots, but even in March it can be really busy. (We were there in March and by afternoon most spots were busy.) Of course, once you do find a spot you like, you can stay there and enjoy it for as long as you want! We love both AZ and NM and travel there regularly – I think you will find it an amazing part of the world. Thank you, Anita. It’s an amazing place and I can’t believe it took me so many years to get there. If you haven’t been there since you were a kid, you should go back! I think you’ll find you’ve forgotten a lot and will discover some new wonders. Happy travels!